is the ideal solution where there is a need to obscure the contents of a room, or even hide an unsightly view outside. 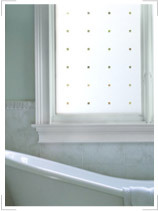 Privacy film provides maximum light transmission when compared with traditional window treatments, like net curtains or blinds, and requires minimal cleaning. Adding a design or pattern makes it possible to peek out (through the cutouts), whilst still making it difficult for anyone to see in. This is particularly effective where there is a gap between a 'nosy neighbour' and the privacy film, such as your garden or a road. 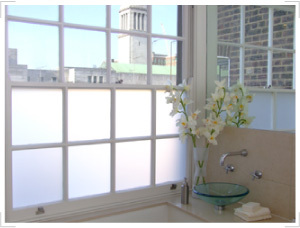 Privacy film is often referred to as residential window film, reflecting it's popularity in densely inhabited urban areas. When used for bathrooms, figures are rendered as soft diffused shapes, barely recognisable as people. Our privacy film is a 70 microns thick quality vinyl film which has an exceptional level of light dispersion, even when condensation has formed on it's surface.